Ignite your creativity with some of the most stunning images you've ever shot. 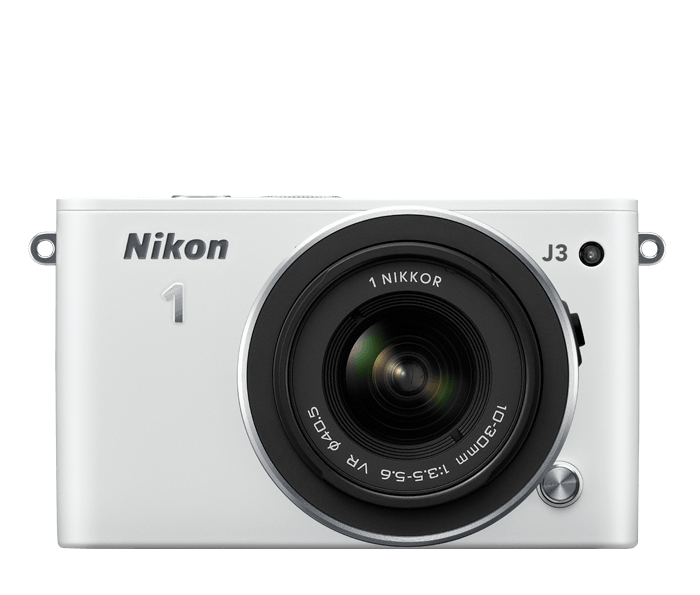 The 14.2-megapixel Nikon 1 J3 brings your vision to life as exceptional photos, HD videos and Motion Snapshots that will have you capturing more moments than ever. Beautifully designed, remarkably simple and faster than any camera you've ever experienced, the Nikon 1 J3 will become the centerpiece of your creative expression and an endless source of inspiration. The first thing you'll notice about your Nikon 1 J3 is its extraordinary speed. The LCD display has absolutely no lag. That means you can frame shots faster, pan faster, zoom faster—do everything faster. The Hybrid AF System is the fastest in the world*, so your images will be crystal clear, whether you're shooting a soaring bird or a fidgety child. The shutter fires at a blazing speed—up to 15 shots per second continuously—so you can freeze even the fastest moving subjects. 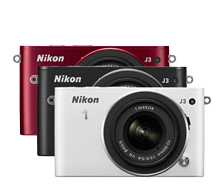 *Among digital cameras with interchangeable lenses available as of December 20, 2012; based on Nikon research. The best moments are made (and missed) in an instant. But imagine being able to slow down an important moment—to see live action in slow motion. With the Nikon 1 J3 camera's amazing Slow View mode, that's exactly what happens. Slow down what you're seeing on the LCD, then select the shot you want. Combine that with Smart Photo Selector, which fires 20 shots with a single shutter press and selects the best five for you, and you've got every advantage for catching those once-in-a-lifetime moments. Your creativity isn't limited to still photos with the Nikon 1 J3. A single press of a button and you'll be recording in dazzling Full HD 1080p video with stereo sound. See something that would make a great still image while you're recording? Simultaneously shoot full-resolution photos without missing a beat. Get the best of both worlds. Your friends and family will love seeing your creations, and with the NIkon 1 J3, you'll never have to wait to share them. Add Nikon's WU-1b Wireless Mobile Adapter (sold separately), and instantly transfer your photos, videos or Motion Snapshots to your smartphone, tablet or compatible Wi-Fi enabled device±. Then share them as usual—by email, text message or by uploading them to your favorite photo-sharing website. It couldn't be easier! Now your Nikon 1 J3 can really go everywhere—even down to 130 feet (40 meters) underwater! Compatible with the Nikon 1 J3 and the 10-30mm VR lens, the WP-N2 waterproof housing lets you keep taking photos and videos whether you're above the sea or below. The lightweight and sleek WP-N2 waterproof housing maintains your access to key camera controls and buttons, giving you the same creative control you enjoy—on land or underwater. Relive your nautical adventures with the brilliant photos and HD videos only Nikon 1 can achieve. Capture the essence of a moment like never before with Motion Snapshot, a unique blend of motion, stills and sound that can be shared as .MOV movie files or arranged into an exciting slideshow. Add artistic flare with the camera's Creative Mode—shoot in black & white, highlight a single color in an image, create expansive panoramas and more. You can even preview your shots before you take them with the Live Image Controls. Like all Nikon cameras, the Nikon 1 J3 performs brilliantly in low light. High ISO sensitivity (up to 6400) lets you shoot without a flash at weddings, concerts, parties—places that usually require extra illumination. Your photos will be true to your memory of the moment; and in extremely dim situations, the pop-up flash automatically lights a great shot.